Six months ago we were getting 17mm of rain per day yet that is the July total rainfall and that fell 3 weeks ago. This part of Cheshire tends to miss out on summer storms as they tend to follow the hills on the county's edge and here in the centre we miss out. 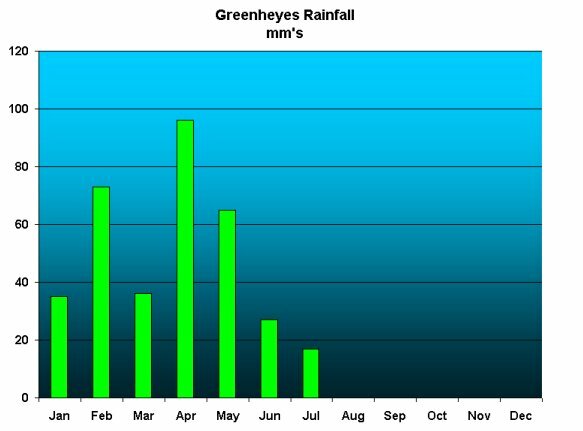 The graph on the right shows the monthly rainfall at greenheyes so far this year. 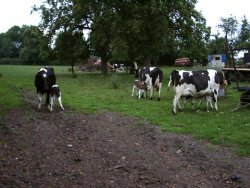 We have had 2 calves born this month 1 Simmental heifer and 1 Aberdeen Angus heifer; here (left) they are together with 2 of last month's calves having a feed from their mothers. Also here are some of June's calves drinking their milk from the buckets. 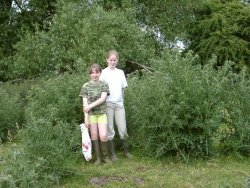 This picture of Becky and Sarah shows how high our thistles were getting until we hired this "pasture topper" machine to cut them down. Last winter's rains had seen them really grow thanks to Nigel Hill for the hire of the machine. 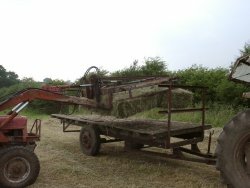 On the 2nd we mowed for hay and due to Moreton contractors having finished Alan our friend and Combine driver baled it for us. 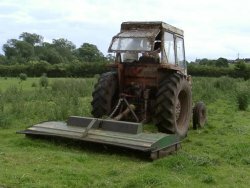 Alan uses a "flat eight" system, which means the bales are automatically arranged ready for picking up by this attachment for our loader tractor. It certainly proved much easier loading. 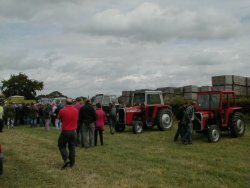 It was a big sale and many farmers were there partly (like us) as due to Foot and Mouth no auctions have been held for months, as it was a day out. 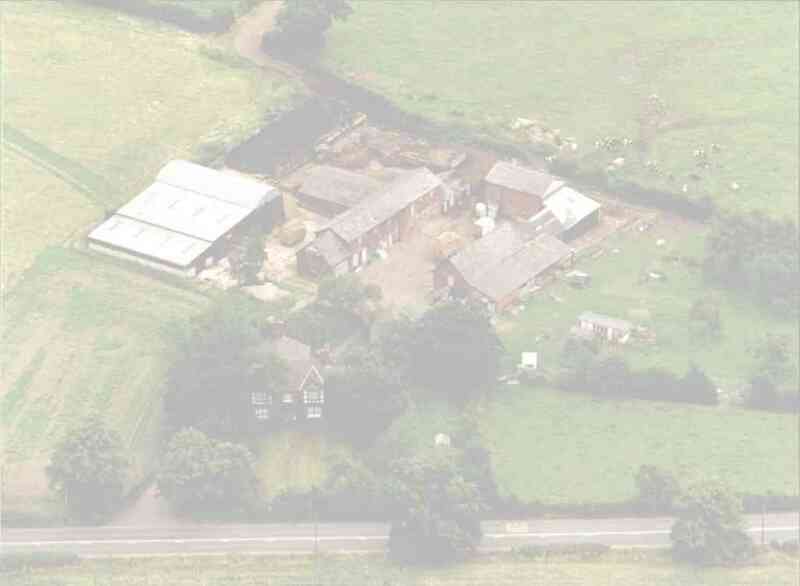 On the 11th Jim Chadwick, our feed salesman visited, this was the first time for 4 ½ months however on the 26th we got our reminder that the disease is still not far away with a case at Warrington about 30 miles from here. The last of the pigs have now gone and I think we won't be getting any more until Foot and Mouth is over. 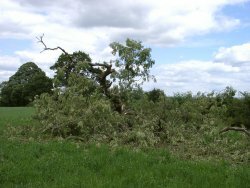 Last week there were gales (no rain) and we had this big Ash tree blown over in the peacock's field. 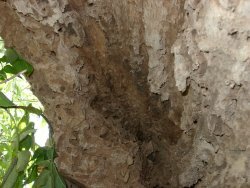 The trunk is nearly 1.5 m in diameter and it snapped off about 3m above the ground. As these pictures show it was rotten in the middle. Local wood-turner Tracy Owen is pictured here (right) cutting some of the trunk to "turn" into bowls and we are having one made you can view some of Tracy's work on www.artistsatwork.org.uk/owen.htm. 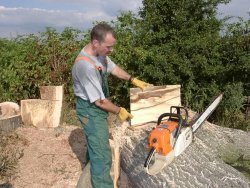 It will be nice to have an item made from one of our trees the remaining wood (most of it) will be burned on the stove next winter. 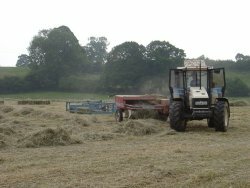 In August we are hoping to take the second cut of silage (when it rains) and from the 6th for we are being joined by Andrea for 2 weeks for a work experience. As you will be aware the Cheshire NFU trailer has not been out on visits this summer due to the disease risk but we will be at ST ANNES SQUARE MANCHESTER with the NFU'S national road show fronted by Johnny Ball on the 4th of August. Johnny tour's the country with his trailer and he is worth a visit if he comes near your town. If you are in Manchester on the 4th come and say hello we will be with Johnny from about 1pm.